Epping Town are on a mission to go back to the glory days of the Seventies and Eighties. In the early 1980s they disappeared due to financial problems, despite the team reaching the Isthmian League, basking in their best ever FA Cup and FA Vase runs and playing the likes of West Ham and Spurs in friendlies. The reformed Epping FC have competed in the Essex Olympian League on and off since 1999 but showed no signs of rising, while much of their once tidy Stonards Hill ground has been dismantled for safety reasons. However, this summer has seen a massive injection of ambition into the club – now back to the historic Epping Town name – under new chairman Chris Ottaway and director of football, former Clapton player Asa Pamplin. Billy Cove, last season’s Ilford FC joint manager in the Essex Senior League, bought into the vision and is speaking openly about promotion – and dreaming of a return to the ESL and eventually the Isthmian League. He told us: “Chris Ottaway has dedicated a lot of time to the club, as have the rest of the committee, so we will be looking to reward them with trophies and promotion this season. “If we all stay together, and everyone of us stays committed to the cause, I do not see any reason why we couldn’t get the club as high as Bostik (Isthmian) football. An ambitious target certainly, but the new club set-up has made a strong start reaching out to the local community, some impressive player recruitment and eye-catching friendly results. They even bagged some silverware, winning the Walter Tull Trophy at the Old Spotted Dog against Clapton FC, a club seven divisions higher. Cove said: “Pre-season has been going really well, every team we have played against has been a minimum of 5 divisions above us. We have won 3, lost 2 and drawn 1, so I am very happy with that. “We have 1 player who played for Epping last season, the rest went their own ways. I have brought 3 players from Ilford and the rest are made up of new recruits. And will he treat the Essex Olympian differently to the Essex Senior League, the level Cove knows best? “We will play as if we are playing in the ESL as our aim is to get there as soon as possible. 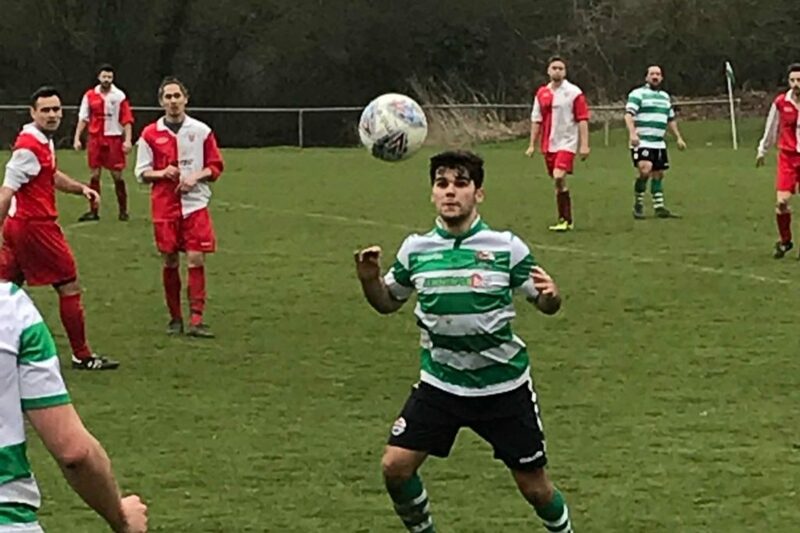 There are similarities between Clapton CFC and Epping Town right now, two ambitious clubs lower who want to rise through the league pyramid and enjoy the ride. Indeed the clubs will meet again once the season starts in the Anagram Records Trophy. Clapton CFC player/manager Geoff Ocran told us: “I suppose some will see this game as a dress rehearsal for the pending cup game in October so I’m expecting a fiercely contested friendly (Irony). The Tons have notched up two wins in the last fortnight, 4-2 at Sporting Hackney and 3-1 at NW London, and Ocran is happy with how pre-season is progressing and his team is gelling. He said: “We go into the game high on confidence with what I thought was an impressive win on Saturday. “It was a mature performance tactically as my philosophy will always be to try and play but most importantly to be effective with an end product. And the game will have particular significance for both Pamplin and Cove – pictured above eating a burger after playing a blinder in a charity fundraiser for Waltham Forest FC last season. Cove explained: “Clapton is, and always will be a club close to the hearts of Asa and I, Asa is an ex player and so is his late father Bobby. “Unfortunately, I never got to play for Clapton, but I always enjoyed playing against you, and had a horrible habit of scoring. Epping Town vs Clapton CFC kicks off at 2.30pm on Saturday, August 18th at St Johns School, Epping. Admission is £2.